Owing to increasing number of working parents and rise in the number of nuclear families, the demand for baby monitors have increased. In addition, an increase in the number of day care facilities has added on to the increased demand of baby monitors globally. High growth in disposable income in emerging economies and increased propensity to spend on baby care products is also positively impacting the market, especially in developing economies of Asia Pacific and Latin America. Transparency Market Research estimates that the global baby monitors market will exhibit a 4.4% CAGR from 2016 through 2024, rising from a valuation of US$876.8 mn in 2015 to US$ 1,291.8 mn by 2024. On the basis of product type, the baby monitors market is examined in the report for product varieties such as audio baby monitors, fixed video baby monitor, and pan and tilt baby monitors. 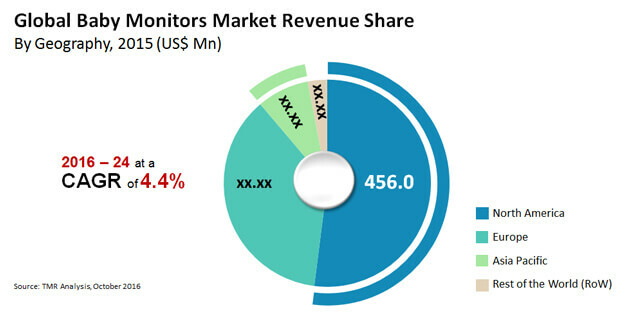 Accounting for over 45% of the global baby monitors market, the segment of fixed video baby monitor dominated the market in terms of revenue in 2015. The trend is expected to continue over the next few years as well. Advanced features of fixed video baby monitors, such as the possibility of real-time sound and video transmission, temperature sensing, talk-back, and heart rate monitoring will aid the future development of the segment over the forecast period. The market for pan and tilt baby monitors is expected to exhibit steady growth owing to their rising popularity among users; these baby monitors offer advantages such as easy rotation of camera to get a perfect view of the baby’s play area and instant temperature alerts among others. The segment will exhibit a 5.5% CAGR over the period between 2016 through 2024. The segment of audio baby monitors, on the other hand, is expected to exhibit a -0.9% CAGR over the said period. The decline in demand for such baby monitors will stem from their limited set of features. Nevertheless, their economic nature will lead to a steady demand from cost-sensitive buyers. Globally, North America is the largest regional market for baby monitors in terms of revenue, holding over 52.0% in 2015 and this trend is expected to continue over the forecast period as well; however Asia Pacific is the fastest growing baby monitors market. High per-capita spending capacity of consumers, growing awareness related to baby safety and security, and a rise in the number of nuclear families are cumulatively driving the market for baby monitors in North America. In addition to this, technologically advanced infrastructure and greater adoption of the innovative and niche baby care products is expected to create a lucrative market opportunity for baby monitors across North America. In 2015, Europe held the second largest market share for baby monitors, accounting for more than 36% of the total market size. Germany and the U.K. are the leading manufacturers of baby monitors in the region. The advancements in baby monitor technologies have positively impacted the demand for the market in the region. Rising expenditure on baby monitoring devices and increasing private equity investments in the electronic sector are the key factors driving the market for baby monitors in the region. Over the forecast period, Europe will continue to account for a significant share in the global baby monitors market. The market in Asia Pacific, however, will outpace both North America and Europe in terms of growth rate from 2016 to 2024. Expansion of the demand for baby monitors in the region will be as a result of changing lifestyles, increasing awareness among parents related to child care, rising disposable income, and efficient retailing channels. Some of the key vendors operating in the global baby monitors market are Samsung Electronics Co. Ltd., Angelcare Monitors Inc., Dorel Industries Inc., LOREX Technology Inc., Summer Infant Inc., Sony Corporation, VTech Holdings Ltd., and Koninklijke Philips N.V.
To stay on top of the game, savvy manufacturers in the global market for baby monitors are expending a lot of energy on research and development to come up with more sophisticated products. This is further intensifying competition in the market. A report by Transparency Market Research finds the global market for baby monitors to be a consolidated one. As per the report the top five companies held about 60% share in the market in 2015. Among the top five, Motorola Solutions, Inc. beat others with a maximum market share of 19.8% in the same year. The report predicts the global market for baby monitors to attain a value of US$1,291.8 mn by 2024 from US$876.8 mn in 2015 by rising at a modest CAGR of 4.4%. Among the baby monitors available in the market, the wireless ones hold a sway over the market by far surpassing the market share of the wired ones. At the forefront of driving growth in the global market for baby monitors is the rising trend of both sets of parents working. This has led to the proliferation of day care centers that take care of infants in the absence of parents. This, in turn, has provided a major fillip to the sales of baby monitors which day care centers bank on to look after toddlers and infants more effectively. Proliferation of ecommerce platforms along with the availability of a wide array of products has also boosted the market significantly. Increasing knowledge of sudden infant death syndrome (SIDS) is another factor helping sales. Falling birth rates and concerns about safety and security of baby monitors which can be hacked, on the contrary, is countering the growth in the market. The various types of baby monitors available in the market are pan and tilt baby monitors, audio baby monitors, and fixed video baby monitor. Of them, the fixed baby monitors contributed to about 45% of the overall revenue in 2015. Going forward too, the segment is predicted to hold on to its leading position on account of the superior features of fixed video baby monitors, including temperature sensing, the possibility of real-time sound and video transmission, talk-back, and heart rate monitoring. The pan and tilt baby monitors would also witness steady sales in the foreseeable future on account of advantages such as instant temperature alerts and easy rotation of camera that accords a proper view of the baby’s play area. Geography-wise, North America holds a leading position in the global market for baby monitors owing high spending capacity of people, prominence of nuclear families, and increasing knowledge about the purposes served by the devices. North America is trailed by Europe in terms of market share. Germany and the U.K. manufacture maximum baby monitors in Europe, whose market is primarily driven by the emergence of better devices and increasing private equity investment in the electronics sector. In the next couple of years, however, Asia Pacific will outshine all other regions vis-à-vis growth rate. Increasing per-capita incomes, changing lifestyles, growing awareness in parents about childcare, and powerful retailing will bolster the market in the region. Important participants in the global baby monitors market profiled in the report are Dorel Industries Inc., Samsung Electronics Co. Ltd., LOREX Technology Inc., Angelcare Monitors Inc., VTech Holdings Ltd., Summer Infant Inc., Sony Corporation, and Koninklijke Philips N.V.